There are a lot of hunting knives in the market today. I mean a looooot ... And each one boasts of different features, qualities, usability, and pros and cons. Choosing the right one for you can be challenging and confusing because of the varied options that are out there. This article aims to help you make the right decision in choosing the best hunting knife for your hunting requirements. We have captured here 15 of the best hunting knives that we could find. A detailed description of fixed blade or folding hunting knives are presented below. Manufactured by Gerber, a company with a renowned record of manufacturing high quality survival knives particularly for the US military, Gerber Strongman Fixed-blade Knife- Coyote 30-001058 is well built for all types of survival applications and combat. It comes with a sheath that can easily be mounted in many ways, hence making it a reliable survival knife for use when on duty or off-duty. 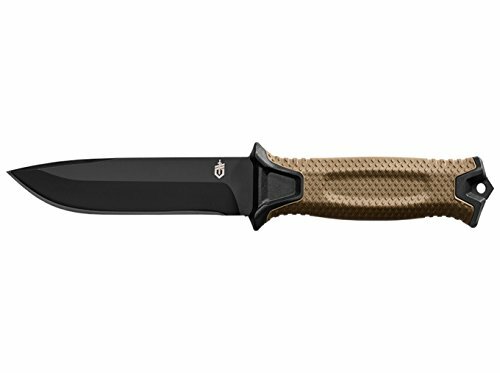 Boasting a full tang blade with a black ceramic coating, this survival knife is meticulously crafted to meet the needs of military survival training. The fixed-blade knife has a diamond-texture rubberized handle, designed to give you a firm grip whenever you are using it. The striking pommel which is strategically positioned at its base works to cut through hard surfaces, therefore making this fixed-blade survival knife suitable for rescue operations. The Gerber Strongman Fixed-blade Knife - Coyote 30-001058 is loaded with several impressive features you can never get in an average survival knife. Innovative Sheath - the survival knife boasts an innovative sheath that is ultimately first of its kind. Its multi-mount sheath is quite easy to use. In addition, this sheath can be easily mounted horizontally on your belt. It can also be mounted in a traditional drop-leg fashion. Above all, the sheath can be customized to specifically meet your personal needs in the field. Horizontal Belt Carry - the belt loops are detachable therefore allowing for a horizontal carry along your waistline. Molle Mount - the survival knife’s sheath is normally setup using a Molle strap hence enabling you to carry the survival knife vertically. Vertical Belt Carry - you can carry this StrongArm survival knife on your hip, meaning the knife is ever on hand and ready for the job. Gerber StrongArm Fixed Blade Knife - Coyote 30-001058 boasts an innovative sheath that features a multi-mount sheath that is not only very easy to use but it can as well be mounted in several ways ranging from vertically, horizontally to traditional drop-fashion. The sheath also makes the survival knife customizable to meet your individual needs. Gerber Strongman Fixed Blade Knife is a high quality survival knife that is designed for a wide array of survival applications. It is also quite comfortable to use and can be used for almost all cutting tasks. With a super study handle and a razor sharp blade, Mossy Oak 2-Piece is by far the most reliable hunting knife that is well crafted to meet all your outdoor cutting needs. Manufactured by Mossy Oak, a company that boasts a long history of producing high quality hunting knives, this hunting knife comes very handy in hunting season. The small, good looking and extra sharp hunting knife offers a solid grip and it is superbly designed to meet all of your hunting needs. It has a plethora of impressive features, hence making it a great set for any hunting enthusiast. High quality - its CPM 530V stainless steel cutting blade is awesomely well balanced, hence offering great edge qualities. Its Santoroprene handle provides excellent flexibility coupled with great strength. Therefore, this hunting knife is meticulously designed for tough cutting jobs. Great design - with a fixed blade, this full tang hunting knife offers great strength and excellent reliability than the average hunting knife. Its simplicity makes it quite easy to clean. Lifetime guarantee - it has a lifetime warranty alongside a LifeSharp Service offered to ensure the hunting knife is ever in the best possible condition. Whenever sharpening or repair is needed, the lifetime warranty takes care of all that. Ever ready for the job - the small-sized hunting knife is a reliable option for your tough cutting tasks. It comes with a molded sheath that is not only durable, but also provides multiple carrying positions. Superbly made for hunting - it comes with a drop-point blade that is versatile and well-balanced. As such, it is ultimately a great pick for hunting purposes. Mossy Oak 2-Piece has an extremely well-balanced stainless steel blade that is awesomely designed to offer superb edge qualities. This high quality hunting knife has a simple yet great design, ultimately making it a great hunting knife that is reliable for all your hunting needs. Mossy Oak 2-Piece is absolutely an excellent choice of a hunting knife. 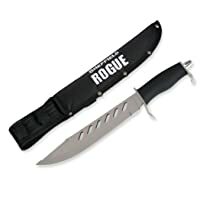 Its razor sharp blade that doesn’t lose edge even after prolonged use makes this hunting knife a great set of knife to include in your knives collection. 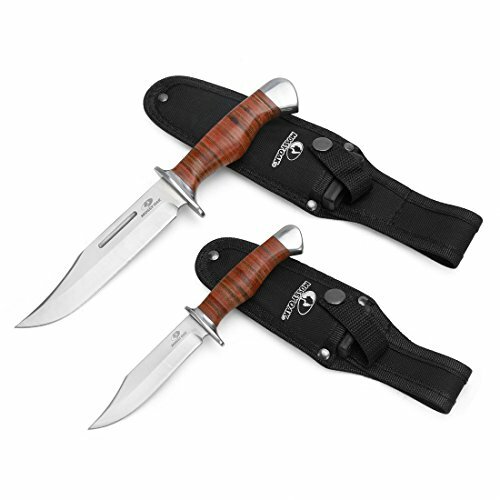 With multiple exciting features designed for camping and fishing, Bone Collector Handmade BC808 is ultimately the bestselling hunting knife that is perfect for hunting and other outdoor tasks.